January – Oak Hill Tavern Run, Sunday, January 27. Distance TBD. The Oak Hill Run Tavern Run starts and finishes at the Oak Hill Tavern in North Kingstown. Meet at the Oak Hill Tavern before 2:30pm. The run starts at 2:30pm. *These are club runs, so don’t look for information online. No registration fee, no pre-race sign up. Just show up and run. The race series will consist of male and female divisions. You don’t have to sign up. Just show up and race. Your score for a particular race is based on your finishing place relative to other club members in the same gender category. The better your finishing place, the higher your score. Details of the scoring system are explained below. Your best 8 races count toward your series standings. All Narragansett Running Club members are eligible. The Oak Hill Run Tavern Run starts and finishes at the Oak Hill Tavern in North Kingstown. Meet at the Oak Hill Tavern before 2:30pm. The run starts at 2:30pm. The Super-7K Reunion Club Run is a group fun run to commemorate the old Super 5K. Meet at Twin Willows before noon. The run starts at noon. The Homestead 9K is a group fun run that starts and ends at the Homestead Restaurant in Exeter. 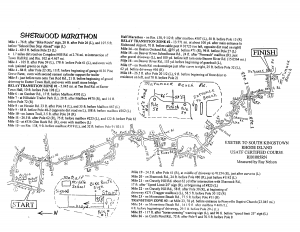 The run starts at 7:00 p.m., and is in the form is a casual 9-K road race on a challenging course. The 66-Minute Beach Run is a fixed-time race where runners try to run as far as they can in 66 minutes. Two cones will be placed exactly ½ mile apart on a beach in North Kingstown. The race starts at the midpoint of the two cones, and runners will run from one cone to the other. At the end of the 66 minutes, race officials will call time, and runners will finish whatever half-mile leg they are on. Race officials will note the overall time, distance, and pace, then calculate a distance for 66 minutes based on pace for the overall distance. For a particular race, everyone gets 1 point for finishing. Additional points are awarded based on finishing place. Still more points are awarded that reward those who participate in low-turnout events. First Term: Everybody gets 1 point for participating in the race. Second Term: This term represents points based on your performance relative to other clun members in the same gender category. Its value is 1 for the top finisher, with a descent increment down to the last finisher, for which its value is . Third Term: Everyone splits 7 more points evenly.